Domestic Violence charges were dismissed earlier this week by a New Jersey Judge after Ray Rice completes a Domestic violence diversion program. Rice was interviewed afterwards and said he very sad to leave the city of Baltimore but he was hoping that he could move on and put this behind him. As part of the domestic violence program, Rice was required to enroll and complete counseling. He told the media that he came away from his counseling with a appreciation for patience and love. 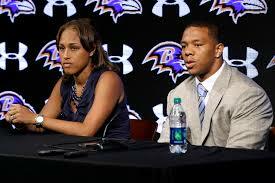 The consequences for Ray Rice have been far reaching. He was suspended by the NFL and released from the Baltimore Ravens football team along with his $35 million contract. It remains to be seen whether Rice can make a comeback in the NFL and what team, if any, will take a chance on him. TILDEN LAW is rated A+ by the Better Business Bureau and has 20 plus years experience representing clients in Winter Park Domestic Violence cases , Winter Park Domestic Violence Injunction hearing and hearings for Injunctions for protection against repeat violence. Contact TILDEN LAW for a free and confidential case evaluation to determine your best defense in combating your Winter Park domestic violence charges hearing, 407 599-1234. Beginning in 1923, attorney John Tilden, Esq. established his law practice in Downtown Orlando with a full service law firm serving Central Florida residents. Following in his grandfather’s footsteps, attorney N. Fleetwood Tilden, Esq. began his Central Florida law practice after graduating from law school in 1993. After a career as an Assistant State Attorney prosecuting Central Florida criminal cases, the Law Office of Tilden Law was established. Practicing exclusively Criminal Defense, Mr. Tilden has handled over 5,000 criminal cases.